Fring – One of the Best iPhone Apps so Far! 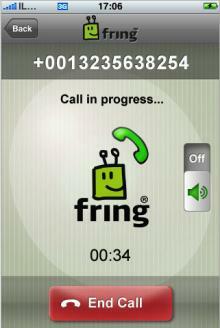 Fring, a new iPhone app, that was recently released had created lots of buzz. What make Fring so powerful and unique is it’s ability to make VoIP calls on the iphone. If your like me, you rely on skype for business. It allows me to keep in contact with my remote coworkers and business associates. I’m also easily able to make international phone calls for a very low rate. The thing that is great about Firing, it that it brings all of this to the iPhone. Now I can make a skype call on my phone, and I’m not tethered to my computer. I can skype on the go, and not have to pull out the laptop to send an important message. The possibilities are very exciting. The other great thing about Fring, is it offers additional support for most of the common instant messaging system, including twitter. This is great because you can keep up with all your friends in on place, on your iPhone. Fring is a free download from the iTunes store, I recommend that you get it today.